A Lotte Mart is seen closed in Hangzhou, Zhejiang province, China, March 5, 2017. A growing number of South Korean companies are feeling the impact from China’s backlash over Seoul’s decision to begin deployment of a U.S.-made missile defense system at home. Chinese employees of South Korean companies and those working for related industries are also getting caught up in the diplomatic spat. Lotte Group, the South Korean company that provided the military with a plot of land for the deployment of the Terminal High Altitude Area Defense, or THAAD, has already had more than 50 of its stores closed in China. A spokesperson for the company told VOA that 55 of Lotte’s stores have been closed, impacting 7,000 of the company’s Chinese employees. 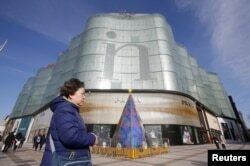 Lotte said it employs some 20,000 in China. The company has around 115 outlets and facilities in China. Although company sales records attribute only a small portion of Lotte’s overall sales to its biggest overseas market – China – the country is a major destination for South Korean trade and Lotte is not the only company being impacted. A woman walks past an Intime Lotte Department Store in downtown Beijing, China Jan. 10, 2017. The backlash is impacting cosmetics, tourism and other sectors as Chinese authorities step up their use of administrative related measures and behind the scenes prodding to put pressure on Seoul. This week, a South Korean and U.S. joint venture between Lotte Group and American candy giant Hershey Co. confirmed that it was ordered to stop production because of safety violations. Some airline operators in China have suddenly halted routes to South Korea. According to a statement on the website of South Korea’s Eastar Jet, starting next Wednesday, flights between several Chinese cities – including Harbin, Shenyang and Ningbo - and the South Korean city of Cheongju and tourist hotspot of Jeju, will be canceled. The notice said flights will not resume until October 28, 2017. The statement listed “worsening China/South Korea relations” as the reason for the change. FILE - Workers on lifts are pictured near the tail of a Boeing 787-8 Dreamliner being built for for Xiamen Airlines. The head of Xiamen Airlines, Che Shanglun, told reporters on the sidelines of high-level political meetings in Beijing that some passengers were canceling or postponing their trips to South Korea. “We haven’t reduced flights, but passenger numbers have fallen… by about 10-20 percent daily, Che said. So far, state media has largely led the push for sanctions against South Korea. The Chinese government warned that the public could respond, but also stressed that law abiding foreign firms are welcome in China and will be protected. The government’s ambiguous stance seems to be a cover for its aggressive efforts behind the scenes to make South Korea feel the pinch and the Chinese public believe that the outrage is coming from the ground up. But, clearly that is far from the case. While there have been some small and sporadic protests. Public outrage over the missile deployment in South Korea seems muted in comparison to the public outcry over a territorial dispute with Japan in 2012 over the Senkaku or Diaoyu islands as they are called in China. On Friday, at one Lotte Mart in central Beijing that is still open, it was business as usual. Customers were coming and going - both young and old. Some pulling grocery carts, others with hands full of tasty pastry treats. None were willing to talk about the dispute or comment on what the government and some online argue is widespread public anger over the decision. A security guard was on the lookout at the door and two others sat nearby at the bottom of an escalator that leads down to the below ground shopping mart. Their presence appeared to be part of what has been described as an increased security presence at stores in case protesters gather outside. But none were seen. The store’s general manager was unwilling to comment neither on the ongoing dispute nor on concerns he might have about the fate of the store. One woman said that if the store did get closed down she would just go elsewhere. She did not have any comment about the ongoing dispute, that many online claim has their blood boiling. Pictures of protests outside some stores have been posted online, but on social media there were just as many sarcastic remarks about the push to apply punishing sanctions on South Korea as there were calls to do more. The comments were found on the popular online news portal Netease and in response to an article about worsening China/South Korea ties and its impact on the hotel industry in South Korea. The report said that in response to the deployment hotels in South Korea saw a 30 percent drop in reservations and that hotels affiliated with Lotte were leading the way. Many were skeptical that the calls for a boycott would last, noting that the last time the Chinese were rallying against Japanese goods, the push did not last long.